Listen: How can veterinary and agricultural researchers benefit from Australia’s innovation system? 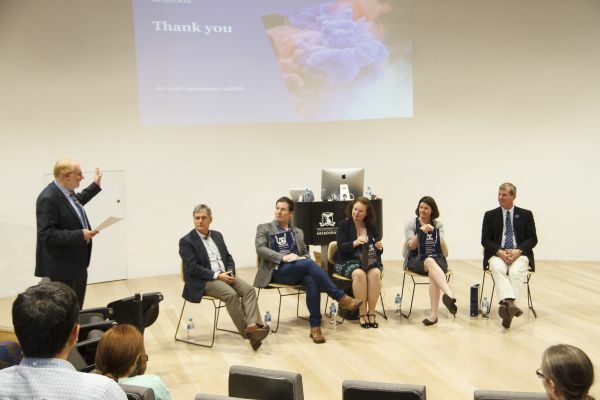 A panel of experts in science, industry and public policy delivered advice for academic researchers on collaboration across disciplines on projects, working with industry and managing intellectual property in a panel discussion. 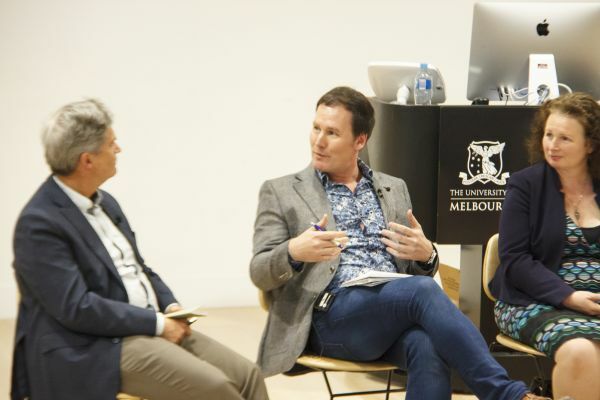 The panel, “Achieving impact through Australia’s Innovation System - Shaping the future from within a Veterinary and Agricultural Science Faculty,” commenced the Faculty of Veterinary and Agricultural Sciences’ Research Week 2018. Research Week celebrates and progresses research in the Faculty through events based on the theme of impact through collaboration. On Monday 12 November, the panel event brought leaders in the sector together to discuss the role university research plays in innovation and the development of new products and technologies, how scientists should measure impact, what leads to a successful collaboration and how training of early career researchers could be improved to better prepare them for successful careers and industry collaboration. Dr Rohan Rainbow, Managing Director at Crop Protection Australia. Several themes emerged in the discussion. Associate Professor Joanne Devlin, a veterinary virology and public health leader with a particular interest in vaccine development and disease control, said clarity in the aims of a collaboration are vital. “I think collaborations work well when everyone is going towards the same goal,” she said. Associate Professor Joanne Devlin and Dr Rohan Rainbow. Professor Herbert Kronzucker, a leading plant scientist whose research has led to improved rice production and the alleviation of world hunger, said patience and perspective is necessary in science, giving the example of a mentor who lived to see his work on plant chlorophyll applied in drones and satellites decades after its publication. “As a scientist, you have to be patient early on,” he said. Dr Rohan Rainbow, whose 30-year career has spanned research organisations, industry and policy advice, said collaboration is challenging but necessary in the Australian environment. “The reality is, in Australia, we’re actually a small county and we need to work together on some of the issue that we’re dealing with; some of these issues are so intractable that we just need the best minds around them,” he said. Professor Kronzucker said all collaborations require researchers to build up trust over time. “These things don’t happen suddenly,” he said, describing how a very successful relationship he developed with researchers at the Chinese Academy of Sciences started with a conversation at a conference and had led to 25 research publications. Cassandra Meagher, whose policy and regulatory work in the Victorian Government has underpinned the implementation of electronic sheep identification and actions plans for the control of wild dogs and invasive fruit flies, emphasised the important of being succinct and providing decisionmakers with a memorable example. 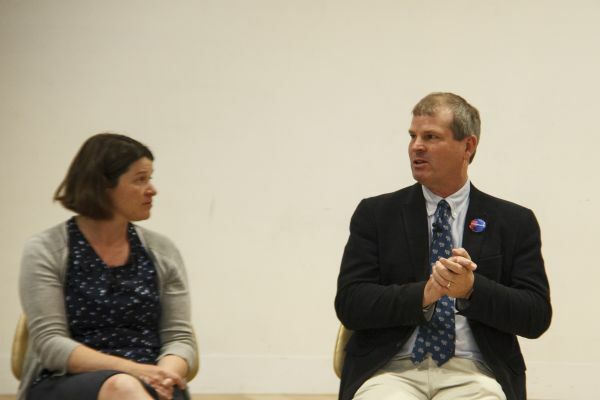 Dr Rainbow said the greatest challenge he found in his early research career view was translating scientific research into farmers adopting changes in practice. “I learned from some of the best in the industry in terms of communications, and unfortunately as a scientist, you’re going to have to learn to become a good communicator,” he said. Ms Meagher completed masters research into competition and privatisation of public utilities and emphasised that in collaboration with industry over intellectual property – and concerns about ownership of the IP generated by research – researchers should bear in mind both competition and coordination. Dr Rainbow agreed considering mutual benefit is vital. Professor Frank Dunshea, Associate Dean (Research) at the Faculty of Veterinary and Agricultural Sciences and the sponsor of Research Week, thanks the panel. Professor Kronzucker said he thought concern over IP was a major reason why scientists were reluctant to engage with commercial partners, but said he felt strong commercialisation support structures were of great value to academics working with industry. Story and images by Stuart Winthrope.